Here’s a little preview of a part of the book I am writing called ‘The Gospel for Geeks‘. For many people concepts about ‘Faith‘ are illogical and nonsense. For me faith in God is completely logical. The Gospel for Geeks is a way of describing the Christian faith using the technology concept of CONNECTION. In this diagram you can see that I call Heaven ‘the Genesis Cloud’. I think ‘Cloud Computing’ is a good analogy for the unseen spiritual world – it’s ‘out there‘ somewhere, but you can’t actually ‘see it’ or touch it. I know Facebook and Google exist because I can connect to them. I don’t know ‘where’ they are (meaning their computer systems) but I know they are real because I can connect! God is like this. You won’t really know He’s real until you connect. Until you connect, describing what, or Who, God is, is like going back to 1939 and trying to explain what Google is to Glenn Miller! 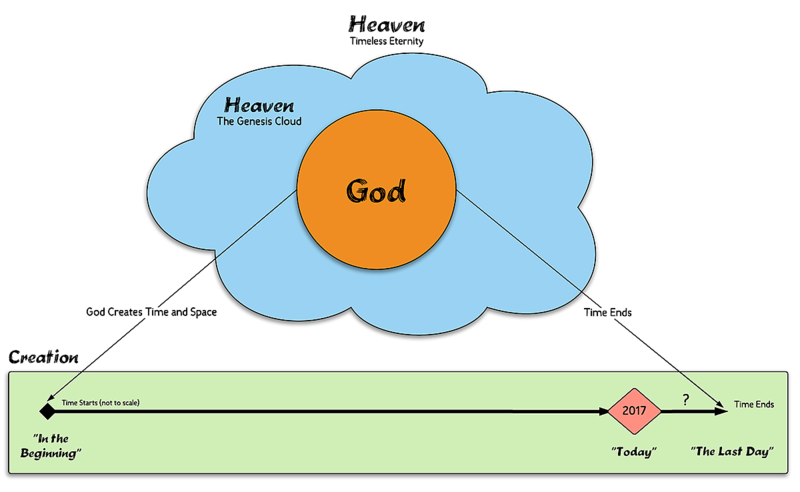 In this diagram I am showing that God exists ‘outside’ creation and outside ‘Time’. Time is in fact a part of God’s creation. It’s the framework in which we, and the whole of creation exists, with all its limitations and rules. God is not limited by the framework of Time and its rules because He exists outside it.